“Farwell Michigan” is located on the southern border of Clare County. The town was established in 1870 when the Pere Marquette Railroad, building a line from Saginaw to Ludington came through here. It was named after Samuel Farwell, a local resident who took a strong interest in the building of the railroad. Today Farwell retains its small town atmosphere, supported by small businesses and several manufacturing firms. Farwell also plays a role in tourism, being close to the "Lakes" area in the county. For more information on Farwell, MI, visit the Farwell Area Chamber of Commerce. 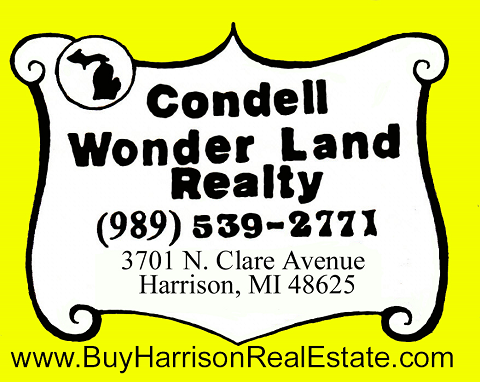 Condell Wonder Land Realty has a great selection of all types of Northern Michigan Real Estate and has been listing and selling Farwell MI. Real Estate for many years, so if you are looking to buy or sell property in Farwell MI. please contact us!